Focused on Christian congregations, this guide provides practical suggestions Christians can take to build safe and inclusive communities and congregations. 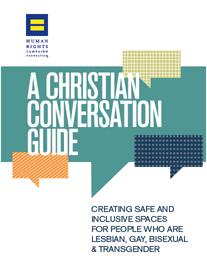 Included in the guide is a step-by-step conversation guide for small group discussions on the health and wellbeing of LGBTQ people; a list of actions faith communities can immediately take in their congregation and communities; as well as a comprehensive glossary of useful terms when talking about sexual orientation and gender identity. The guide is a new resource developed by the Religion and Faith Program and Project One America. If you have any questions please contact Joseph Ward at joseph.ward@hrc.org.